At the end of the 1980's, Aforma Yachts, together with Peter Sampson Design, worked mainly on drawing up designs, engineering and design interiors on every kind of boat, from military and pleasure speed boats to passenger ships and platforms. Using the experience they have accumulated over the years, Aforma Yachts together with Peter Sampson Design, have now decided to dedicate themselves to developing stylish, high-tech super-yachts. 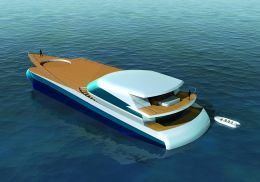 The present production stands out mainly for its design innovation and, one of the projects already underway and capturing attention is "Hylas", a multi-hull that on paper looks extremely interesting. It is, in fact, the multi-hull configuration with its delta shaped central hull that is one of its most interesting aspects, because it should guarantee exemplary stability, a maximum speed of approximately 61 knots and huge internal volumes. "Hylas" is spread across three bridges, with the lower one set aside to accommodate the crew's four double cabins, bathrooms and stern hangar for the two five metre tenders as well as the two jet skis. In reality, the main bridge does not correspond with what, at first sight, appears to be the deck. It is, in fact, a middle of the road structure that foresees a living area and sleeping quarters. The latter, running from the median area to the area at bow, offers four double suites, one with twin beds and a single for the captain, obviously all with en-suitebathroom. The particularly spectacular owner's private apartment is at the extreme bow. This area, in fact, enjoys the natural light coming in through two enormous windows located on the bows of the two side hulls and that also provides a sea view. The suite offers a central double bed, whose privacy compared to the rest of the area is guaranteed by a semi-circular panel. At port there is an office, while on starboard there is a comfortable lounge. Forward, one can access two large wardrobes and a bathroom fitted with Jacuzzi. The whole owner's private apartment is fitted with a sophisticated home theatre system. The living area can be found at stern and includes a lounge with multimedia systems, communicating with the stern terrace, which then leads onto the vast platform. On the upper bridge, there is an internal area that includes the wheelhouse at bow with pilot and co-pilot seats and aft, a dining area for 10 people. In the external stern area, there is a second terrace furnished with chairs and sun loungers, while over the 300mý of the bow, a large Jacuzzi has also been installed. Performance is guaranteed by two turbo diesel engines of5,000 HP each coupled with surface propellers. For further information: Aforma Yachts; Ulica Bratov Hvalic 49; SI-5000 Nova Gorica; Slovenia; tel. +386 53330186; fax +386 53330187; web site www.aformayachts.com.